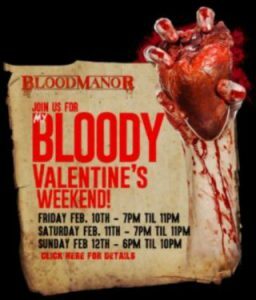 Blood Manors Bloody Valentine is a Haunted Attraction located in , . Team Crypt Creepers reviewed this attraction on February 11, 2017. Forget the dinner and a movie! Throw away those flowers and chocolates! This Valentines Day, take your significant other to the most romantic place imaginable… a haunted house! What? You don’t think a haunted house is romantic? Your loved one cradled in your tight embrace, your hearts racing, you begin to sweat, a scream echos throughout the room, that’s exactly what a haunted house offers you. What were you thinking?? Anyway, haunted houses during this romantic time of year are becoming a hit and Blood Manor has been keeping this tradition going for a few years now. For one weekend in February, they open their doors to guests in hopes of breaking a few hearts… or at least gouging them out. A colorful cast of different creatures and crazies are ready to take you home and just gobble you up. With a cast of about 30 occupying about 20 rooms, this 15-20 minute walkthrough offers you some great sets, special effects and a group of in-your-face actors. So don’t worry, if you come with just a group of friends – or even alone – there’s a chance one of the manors inhabitants will be getting quite intimate with you. The usual cast of creeps and creatures are here: the serial killer, the traumatized patient, the insane butcher, the… pig lady? Most of these maniacs were very much in character, spewing threats or pleas at us as we rounded every corner. Others, though, were either so into their own scene that they didn’t pay much attention to the guests, or so much into their character that they repeated the same gibberish over and over with no real scare. Don’t get me wrong; I’m all for the creepy little girls chanting in the corner or men twitching and muttering as they repeatedly stab a corpse, but if you’re not a distraction for a bigger scare or building the creep factor before some big jump, then it tends to leave guests a little disappointed. Most of the actors were very high-energy and lively… jumping off refrigerators and sliding down poles. A number of them had Valentine-y dialogue ready and took advantage of the holiday and even the weather… commenting on how cold it was outside, and that we should come in to warm up. In a well-lit room, these actors’ makeup was very much on point… being realistic and detailed in the creepy macabre rooms and original and well done in the more outlandish 3d rooms. The downside is that a decent number of rooms lacked really good lighting to show off this makeup. The ones we did see, though, worked where they were found. No outfit or makeup was really out of place and there was no excessive mask use, which allowed for the characters to interact with the guests and use dialogue very well. As well as they went into the themes of their own individual rooms, though, nothing really screamed “Valentine’s Day.” But, I’ll get to that in the Theme category. For a house full of ghouls and goblins, the customer service was very hands on and helpful, not to mention just fun to talk to. I got the chance to talk with a manager, the talent organizer, a makeup artist and even security for a bit and all were friendly and laid back. They have a stanchion set up outside for lines, but with the icy floors from the recent snow and the cold weather, there was no line waiting outside. This also meant no queue entertainment, but coming from someone who hates anything below beach weather, I don’t blame them for not having any actors out there. They did have two security guards to help guide people inside and up the stairs (or elevator; Blood Manor is wheelchair friendly) to their fate. Aside from the metal fence and the two guards, though, it’s a bit tough to know where exactly the haunt is. A sign is bolted into the wall up above the door, but being the middle of a Manhattan block means they can’t exactly build a huge scary façade to attract guests, which is understandable. There was nothing too dangerous about the haunt itself. The only thing that stuck out was one dark room where a prop or two was left on the floor, which caused one guest to trip slightly, but everything else seemed fine. As mentioned above, it’s tough for this haunt specifically to set up an exterior to draw in the crowd… especially during off-season events. During seasonal hours, there is usually a big truck selling tickets, actors, street performers, giveaways and other mobile forms of attention-grabbers. But, they cannot put up large signs, fake walls, or such things that a place on an open patch of land can. Once you get upstairs, the black walls are painted with neon décor, animatronics wait behind corners and an actor usually greets you before you enter, so it’s not a completely random crossover into a dark and creepy world of terror. A lot of love and work has been put into Blood Manor’s set designs and rooms. Many of them have detailed work strewn about every inch of the room. The airbrushed walls in the 3d maze pop out nicely and the pig room, though simple in design, has been known to freak out many a patron with its realistic squealing pig noises and hung pigs blocking the exit. Most of the rooms had their own sound effects or light music to really put you in the moment. The one downside here was the lighting. A number of rooms were dark to the point where you couldn’t appreciate the actor’s costume and makeup or the set design. One room made sense with a strobe light that would go off once the guests hit a certain spot, but two or three other rooms just seemed unnecessarily dim. Aside from the lighting, though, the effects throughout the haunt were detailed and well put together. Normally Blood Manor’s theme is… well… blood. The rooms in the manor are a smorgasbord of frights, ranging from clowns, zombies, little girls and steampunk. They open for one weekend in February for their Valentine’s Day event. That being said, there was a severe lack of Valentine’s anything inside. Some store bought decorations were put up in the first few rooms, but then seemed to disappear. A lot of the actors did throw in some dialogue that tied into the “lovey” theme, but that was pretty much it. Now sure, I know it can’t be easy to turn a caveman scare room into some sort of Hallmark Hearts and Flowers fiasco, but they have done Valentine’s events in the past that stuck out with fun costumes and such. This year, we weren’t feeling the love. You know that feeling when you realize you forgot to get your significant other a gift for Valentine’s Day? A chill down your spine, a sinking feeling in your stomach, the dread of what awaits you behind your door; now that’s fear! Blood Manor was maybe a level or two below that in terms of fright for this event. With a staff of about 30 actors working in the 20-room haunt, they worked well at hitting most of the group, but the scares were mostly coming from directly in front of us or in our line of sight. There weren’t many pop-outs or surprises to catch the guests off-guard; a lot of in-your-face action, but not much subtlety. During the season, this works mostly well since it’s high-intensity, non-stop, fast-paced action. When you’re a small group walking through at your own pace, though, the intensity becomes repetitive and you long for one really good jump-out. With about 20 rooms inside this haunt and a walkthrough time of about 20 minutes, you pretty much get 1 scare per minute. The cover charge for this deadly date is $30, but with a groupon or online code, you can get in for $25. They make good use of the space they have (being one floor in a Manhattan building) and they make practically each room look amazing.